I LOVE the Cars franchise! Ever since Cars 1, I've been a fan and Cars 3 certainly did NOT disappoint! We were invited to check out the new Cars 3 at the beginning of the week and my emotions were all over the place. Don't worry... This post has NO spoilers! From posters and the very first trailer, we know what happens to everyone's favorite racecar, Lightning McQueen. He IS the #95. However... The old timers get blindsided by a new generation of blazing-fast racers! 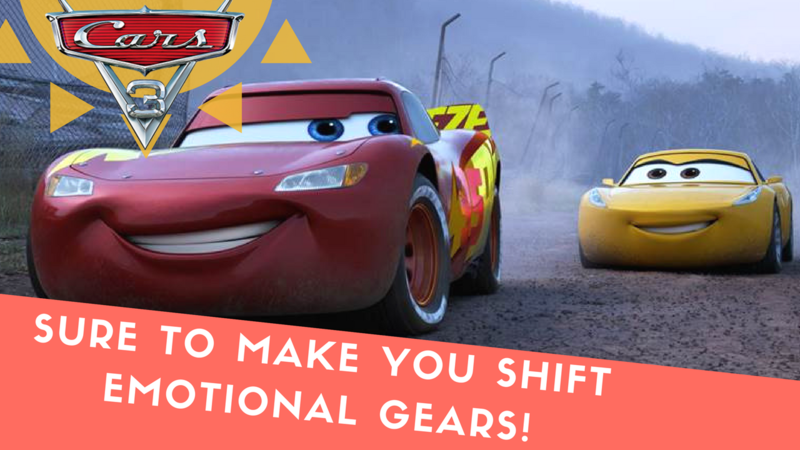 The legendary Lightning McQueen (voiced by Owen Wilson) is suddenly pushed out of the sport he loves and to get back in the game, he will need the help of an eager young race technician, Cruz Ramirez (voiced by Cristela Alonzo), with her own plan to win, plus inspiration from the late Fabulous Hudson Hornet and a few unexpected turns. Proving that #95 isn’t through yet will test the heart of a champion on Piston Cup Racing’s biggest stage! I couldn't contain my emotions. Whether they were happy, shocked, sad, surprised... Cars 3 did NOT disappoint us. From our old time favorites to new classics, Young and spunky cars to terrorizing school buses, everyone will leave the theatre loving a character. Want to know the biggest lesson I got out this movie? Never let someone tell you when YOU are done. Create your OWN destiny! Directed by Brian Fee (storyboard artist “Cars,” “Cars 2“), produced by Kevin Reher (“A Bug’s Life,” “La Luna” short) and co-produced by Andrea Warren (“LAVA” short), “Cars 3” cruises into theaters on June 16, 2017 (TODAY). Will you be front row at the theatres? Have you seen the movie? What lesson did you get out of it? We are really looking forward to seeing this movie. We enjoyed the previous two movies, so I'm sure we'll enjoy this one. The animation looks stunning in the trailer and clips that I've seen. The Cars franchise is really something, huh?! I didn't realize how popular it was and now I'm seeing commercials, ads, memorabilia, etc. everywhere. Can't believe there's a part 3 already. I have loved both of the Cars movies, and cannot believe we now have part 3! It's too old for my little one right now, but I can't wait to introduce her to all 3 when she's a little older. We saw this on Monday for a screening with the kids. They loved it. Hearing all of the kids cheer at the end of the movie was probably my favorite part! :) We love all of the Cars movies. We're really looking forward to the release of Cars 3 here in the UK! I didn't like the first two (although the kids did), but this one sounds like it's a lot better. I think I'm gonna love it! Ironically my daughter and I were literally in the front row of this film. We did have a great time when watching it. I think it brought back some of the heart that was missing in the second picture, not that we didn't enjoy that one. I just felt like it was missing something. This one brought back the heart. I am so excited to see cars 3 with my son. Most of all because he is 12 and still wants to see it! When he asked me I was shocked (because he is a pre-teen) and often thinks he is too "cool to see kiddie movies" but this one holds a special place for me in my heart as he loved Cars 1 and 2.